Each animal’s growth, development, reproduction, and well-being is critically important for a profitable enterprise. Precision farming allows producers to monitor individual animal feed consumption, movement, temperature, sickness, weight, and other factors—often without any human intervention. In a pasture in Woodward, Oklahoma, cattle wear collars equipped with solar panel wings that relay a summary of each animal’s movement to a satellite. 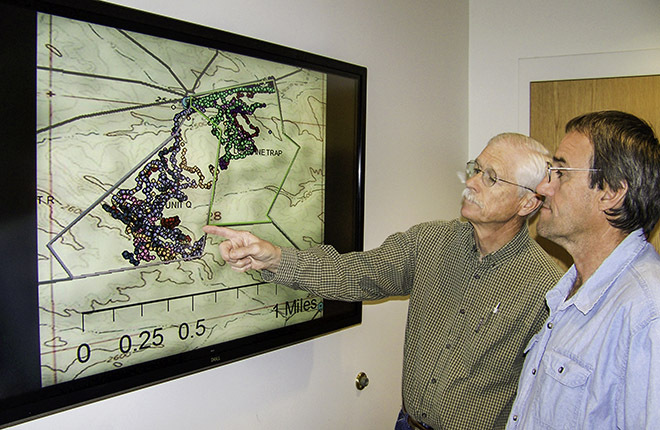 Scientists at the Agricultural Research Service (ARS) Southern Plains Range Research Station use the data to track the cattle. The collared cows wander in six pastures, along with their calves, a bull, and uncollared cows. They have access to fresh water and occasionally hay, and they are fed range cube (high protein) supplements five times a week. The data is used to measure the animals’ activity, which is then used to estimate the amount of body mass change in a cow and her calf—whether they are gaining or losing weight, Moffet says. Scientists are also testing a commercial system, “GreenFeed,” which measures an animal’s carbon dioxide, methane emission, and oxygen consumption, Gunter says. Their preliminary research looks at the effects of different feed treatments on a cow’s energy metabolism—converting its feed and forage into energy for growth and movement. On a winter morning in Miles City, Montana, some cows wait for ranch hands to arrive and feed them, while others eat as much protein supplement as they want before heading out to pasture. In initial trials, Petersen, animal scientist Andrew Roberts, and their team looked at the influence of self-feeding versus traditional supplement hand feeding in winter on the activity patterns of rangeland heifers. One group of heifers was hand fed protein supplements daily. Another group had access to supplements and could choose how much they wanted to eat and when. The average consumption for each animal was about one-half pound per day. A critical challenge facing livestock production systems in the western United States is to implement management practices that optimize beef production while conserving rangeland resources, Petersen says. “How we provided those supplements changed the animals' behavior as to how they used the pasture,” he says. Hand-fed animals spent the first hour of the morning waiting for the feed truck and didn’t graze. Self-fed heifers ate supplement when they wanted, and as much as they wanted, and they grazed when they desired. Cows are fitted with collars similar to the ones used in Oklahoma that give Global Positioning System coordinates every 5 minutes and daily location summaries. Scientists calculate how fast cows are traveling and then assign various behaviors, such as whether an animal is resting, grazing, or walking. ARS scientists, along with New Mexico State University collaborators, furthered the research by developing vegetation maps from satellite images that show where cows are spending their time. Scientists believe the data will show that heifers prefer certain types of vegetation. “We might be able to use precision agriculture to help producers better manage their herds by manipulating how the animals use pastures to benefit productivity as well as the land,” Petersen says. In swine operations, precision farming technology can be a welcome tool for continuous monitoring of an animal’s performance, health, and welfare. Technology can help producers figure out what’s going on with pigs and whether to make management adjustments, such as changes in feed ration or pen size. It can also help them locate sick animals. Another use for precision agriculture is marketing pigs, she says. Packers want pigs at current market weight. The traditional weighing method—running pigs over a scale—is very time consuming for a large number of pigs. Brown-Brandl and her colleagues are developing imaging methods to measure a pig’s weight. They determine the pig’s volume from the pixels in the digital image, and then they use equations to convert volume into weight. She says the error rate is only about 5 percent. “You could put an ink mark on pigs that are market weight and above, so they could be easily sorted,” she says. They’re also using imaging to prevent sows from crushing their piglets. A 3-D camera, mounted over farrowing crates, takes images used to determine a sow’s posture: whether she’s eating, drinking, standing, sitting, or lying with her udder facing right or left. “This allows us to evaluate different sizes of farrowing crates and give management recommendations to producers,” Brown-Brandl says. To alert producers to potentially dangerous heat-stress conditions, Brown-Brandl and colleagues designed and launched a smartphone “Heat Stress” app for cattle in 2016. The app uses weather service data to issue forecasts 1 to 7 days in advance of extreme heat conditions, and it provides recommendations for protecting animals before and during a heat-stress event. So far, the app has been downloaded about 1,500 times. USMARC researchers also are looking at heat tolerance in pigs. Annual losses associated with heat stress in the U.S. pig industry are estimated at nearly $300 million. “Heat stress causes a thermal imbalance—the animal produces more heat than can be dispersed in the environment,” Brown-Brandl says. In pigs, heat stress can decrease feed intake, growth, feed efficiency, and reproductive rate. In earlier research, Brown-Brandl and her team used skin surface temperatures of individual and groups of pigs to determine appropriate temperatures for housing them. Thermal images were taken of 160 group-penned pigs and 20 individual pigs on specific days within a certain temperature range. 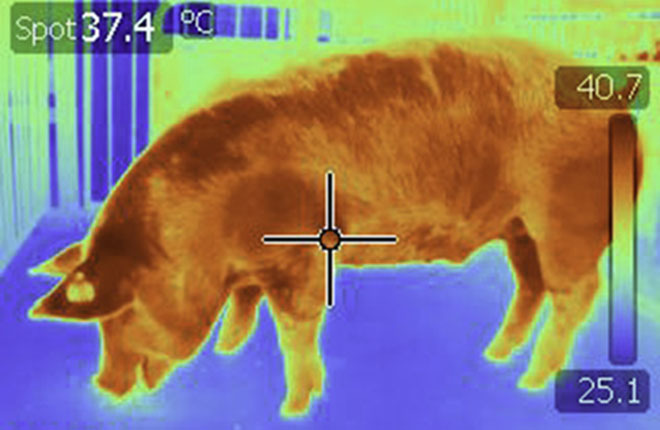 Scientists found that the use of thermal images showed promise in determining heat tolerance for pigs. ARS scientists continue to investigate the use of precision agriculture technology to benefit animal production and health. Their research includes testing and developing methods to help farmers operate more efficiently in managing production costs and increasing production and profits.—By Sandra Avant, ARS Office of Communications. Precision farming helps producers manage individual animals to improve production. ARS develops methods to monitor animals for sickness, feeding, and other factors. Heat stress-related illness costs $300 million in swine production losses annually.